← The NAKED Truth: The Best Beaches! The Awful Time I Met Grumpy Cat! 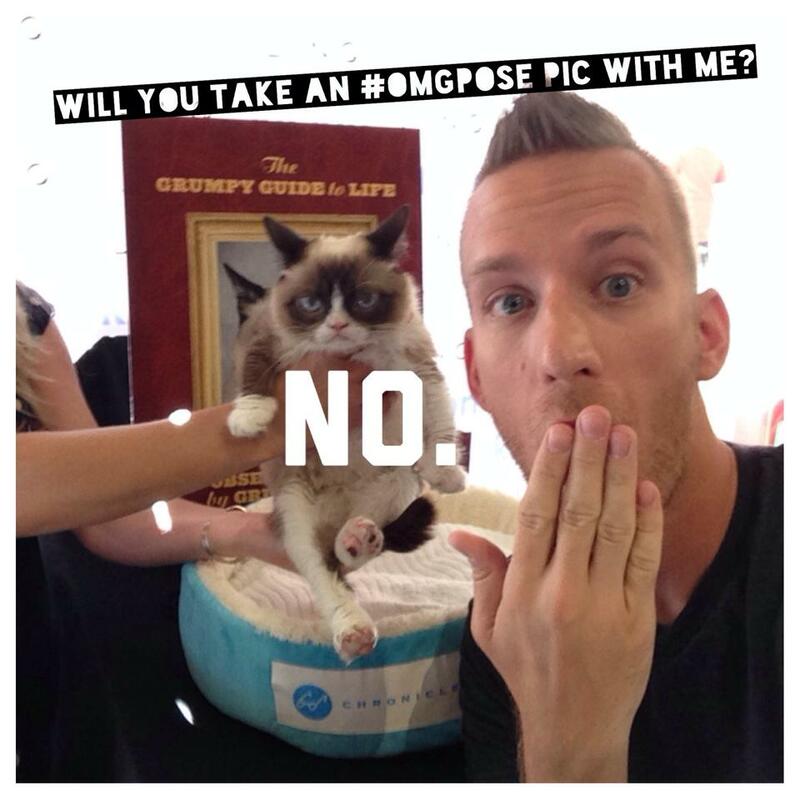 I met the real Grumpy Cat in Las Vegas and it was just awful. When I asked her to do my signature #OMGPose, she said… #NO! (I was sad, even Elton John and Mel B said yes. hehe). This internet sensation was in Las Vegas for the first time to meet fans, Im not so sure she cared to greet anyone. And to promote the new book The Grumpy Guide to Life: observations from Grumpy Cat. Even with the grumpy looks and attitude, it’s hard not to love her. Home: Arizona, if she’s ever stopped and asked for her vet paperwork, she says, NO! I’m legal, leave me alone. Boy or Girl? Many people refer to Grumpy Cat as a boy.. that is incorrect, Tadar is a girl. If you say “Oh, he’s so cute.” She’ll glare ate you and simply say #NO! Photo ops: Meet the grumpiest cat in the World on her current book tour to promote The Grumpy Guide to Life. Till next time remember to live life NAKED! Posted on August 6, 2014, in Uncategorized and tagged gay vegas, grumpy cat, jason dinant, jdotson, kitson, las vegas, naked boy news, real grumpy cat. Bookmark the permalink. Leave a comment.